Spousal – Many questions arise in relationships that spark suspicion of infidelity. By using private investigators, you are able to remain anonymous throughout the process of discreetly discovering the truth regarding your mate. In the event that one tries to uncover suspicion and is unsuccessful, it could prove fatal to the relationship. We as investigators will do the work for you. We offer you guaranteed physical, audial and visual evidence proving as to whether your spouse is faithful and trustworthy. In turn you will be able to make an educated decision based on facts, should you continue to work for your union. Child Support is the obligation of two adults who conceive a child. When one parent is not contributing their responsibility to their child, it hinders the child’s future and home life. Children that lack the nurturing required both financially and emotionally have a more difficult time growing up. If you are in need of financial support from your child’s parent, then why wait your turn after moving through a lengthy court process. Not only will we locate the parent, but will do so at an affordable rate. We will reveal whether they are employed, the amount of money they are grossing and lifestyle choices. By making your situation our priority, no time is wasted and we can work together to prepare developments so that you will start receiving the money you are owed. Insurance Claims Investigations save money for everyone. Why pay an individual Unemployment or Disability when they clearly are using the system illegally to their advantage. If suspicion arises in regards to a previous employee, friend, or coworker collecting government aide unlawfully, it is imperative to take the necessary steps to uncover such behavior. BDA are experts at discovering if a person is still earning money while collecting from the government. We have a team of investigators set in place to track the whereabouts concerning the person of interest. We are able to document all movement from their home to alleged workplace. If the claimant is requesting disability compensation, we monitor activities they are involved in to expose the severity of the injury and whether the perpetrator is claiming assistance fraudulently. Our investigators provide sufficient evidence allowing you to present any necessary information refuting the claim. Abuse cases range from domestic, physical, sexual, emotional, child abuse etc. These cases are usually called in to a police department, and then passed through the system in a series of processes. Although it is extremely important that you report such cases to the police, frequently there are instances when you want to report an abuser on suspicion alone. Police are not able to place charges without evidence. By employing an investigator, the suspect will be tracked anonymously until evidence supporting your claim is captured. We can provide visual photographs, audio recordings, and at times video recordings to validate your claim. Abuse is a severe crime usually performed privately. Our investigators waste no time revealing the core of the problem and the culprit committing the acts. 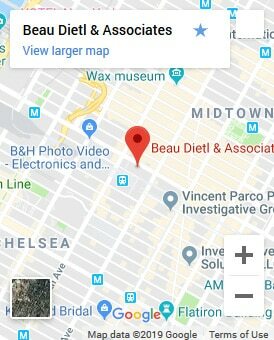 Save someone now by calling Beau Dietl & Associates. Counter Surveillance cases can be conducted if you suspect you or a member of your staff is being followed. Because results are everything, our investigators work in tandem with state-of-the-art equipment from cameras and audio recorders to GPS tracking devices.We also install and maintain covert video and audio in your home or business, all as allowed by law. Listed above are more popular cases we handle on a daily basis, but not limited to. If you are concerned, please call us. It is better to know than assume. We at Beau Dietl & Associates will reveal the answers. No matter the suspicion, we have investigators that are trained and skilled to provide effective surveillance assisting you in any way we can help. All calls are confidential.